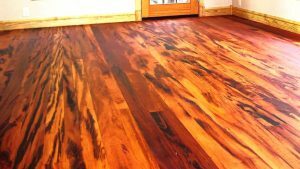 Finishing Your Exotic Hardwood Floors. We’d recommend avoiding darker stains, to let the beauty of the grain and pattern to show through. Most woods darken over time – some dramatically – so you don’t want to create muddy-finish floor. Especially if it could be a regal dark and deep natural tone, without any help from a stain. Also, we’d recommend a softer, satin or matte finish to allow the grain to show, rather reflect like a mirror. A semi gloss will give you a nice sheen without making it look like an ice rink. A brief description of the type of exotic flooring. Brazilian Cherry: South America, similar to American Cherry, but slightly more tan/orange. Deepens to reddish brown. Brazilian Teak: South America, an oily brownish tan wood, with slightly contrasting grain. Patagonian Rosewood – Agnico: South America, wide range of colors and tones from lights to reds, orange, brown even black, changes over time to deep red brown hue. Wenge: Africa, dark chocolate to warm yellow with vivid dark contrasting graining, already dark, Wenge deepens to a deep, warm brown in time. And if theres anything you feel we may be interested in please feel free to let us know!